Teamemo’s fields of application are very different and individual. And so are its users. We have developed a new feature so that power users also get their money’s worth at Teamemo. With the Quickbox it is possible to directly execute many commands that were previously only found in submenus. And the best: You don’t even have to take your hand off the keyboard to operate the mouse. With the help of the keyboard control str + P (Under max cmd + p) the Quickbox opens. Now you can start searching for the desired command. 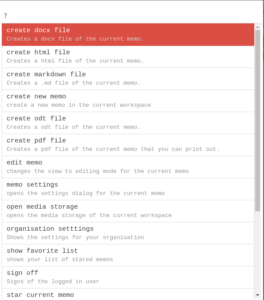 If you want to export the current memo as a PDF file, for example, you can simply type “pdf”. A confirmation with “Return” executes the desired action directly.